This article is copyrighted for Blackcuminseedoil.info. All Rights Reserved. Chris Wark is a health Guru who had Stage III cancer and beat it with a nutritious diet. He did have surgery to remove his cancer and then chose to go chemo-free. He has a website: Chris Beat Cancer where you can read more of his stories. I have been a follower of Chris for a long time and read some of his articles now and then. He is now a follower of mine on my very popular Black Seed Expert page. I saw this salad floating around Face Book today and watched his video and was so amazed at how he created the salad, I just had to write my thoughts down. While he makes a wonderful salad, I do think I would make a few changes, each to their own right. So this is my adaptation of Chris's wonderful salad. Simply Apple cider vinegar (Braggs) and Cold Pressed Olive oil. Only use the best..
No salt at all. He used Bragg's Sprinkle with 24 herbs, curry, cayenne and garlic powder. Now some health professionals shy away from garlic if you have cancer as it is proven to destroy brain cells. But each to their own choices. Some versions of Chris's salad has tons of beans on the salad and more. I don't like to overpower a salad. My version is delicious and nutritious and not too many flavors to have to stomach. 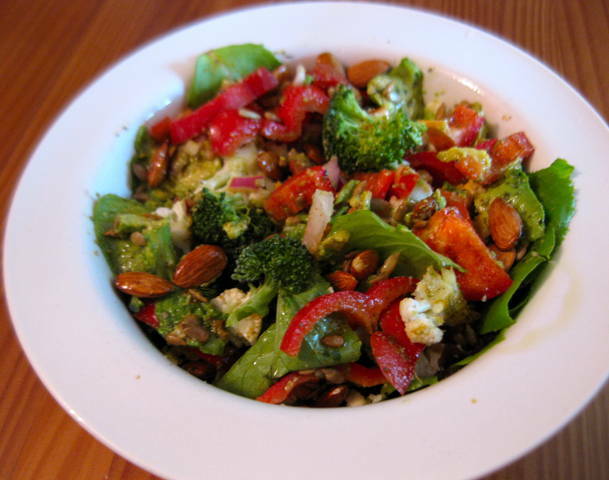 Eating a regular salad is better for you in your cancer battle then to be overstuffed with a heavy meal.